Remember Crocs? Of course you do, it’s impossible to forget the shoe equivalent of Marmite. And while you might be quick to question who loves Crocs, the answer is simple: your dad and, apparently, the fashion industry. You might remember the shoe making its runway debut at Christopher Kane’s SS17 show, and then returning again a few months ago with a new limited edition collection. 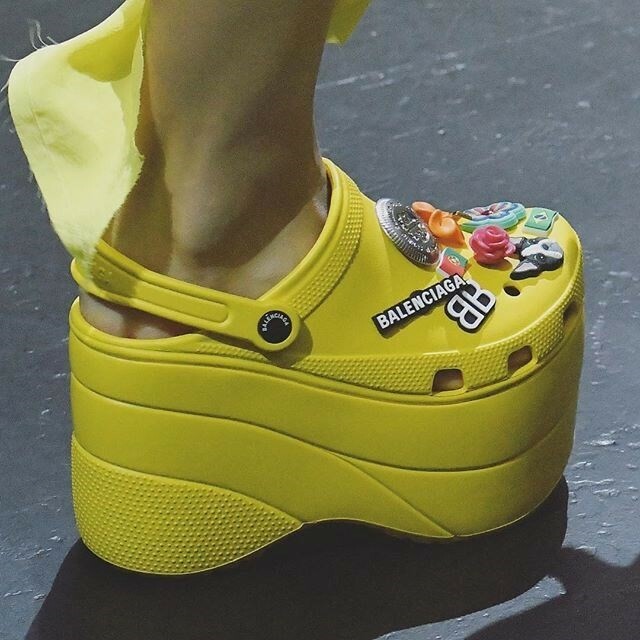 Now, Balenciaga too has put its own version of the foam footwear on the runway today at its SS18 show. Unfortunately Balenciaga’s reimagining of the divisive shoe doesn’t come with crystal embellishments, but instead, flower, star and avocado charms – as well as the Balenciaga logo. They also have the added benefit of being a platform. You know, for when you have to do the gardening at 10pm and then hit the club at 11pm. If it’s not quite for you though, there were also the staple sock/shoe/trouser hybrid printed with dollar bills and stock photo sunsets also appearing in the collection. As for the clothing, it seemed to be a step away from the sophisticated woman of last season and went in more of a punk direction. That’s what the tartan prints, spiked shoes and leather gave us anyway. If you’re desperate to get your hands on a pair of the Parisian house’s crocs, you’ll sadly have to wait until they hit stores next year but there will be plenty of outraged Daily Mail articles over them between now and then to pass the time.